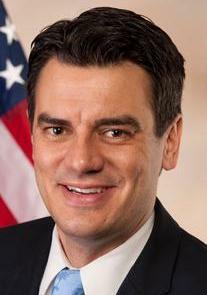 U.S. Rep. Kevin Yoder, R-Kansas, chairs the Homeland Security Appropriations subcommittee. Johnson County leaders have sent a letter to U.S. Rep. Kevin Yoder, R-Kansas, demanding he act to prevent families seeking asylum from being separated at the border. About 50 Republican and Democratic state lawmakers as well as city and county officials signed the letter to Yoder, who is the chairman of the Homeland Security Appropriations subcommittee. The letter says the Department of Homeland Security is harming children by taking them from their parents. Gallagher and Rep. Jarrod Ousley, D-Merriam, delivered the letter to the congressman’s Overland Park office Wednesday and spoke with a member of Yoder’s staff. For his part, Yoder says he wants to find a solution to keep kids with their families. “I don’t know the exact answer at this moment. What I do know is what’s happening right now, splitting these families, goes against our American values, it goes against who we are as a country,” Yoder said. Gallagher and Ousley plan to deliver an addendum to the letter with signatures from additional lawmakers sometime next week. Aviva Okeson-Haberman is a KCUR news intern. Follow her on Twitter @avivaokeson.